The method of diagnosis of pigmentation treatment depends upon the causes of these dark spots. Following are the various causes of the pigmentation and methods of diagnosis based upon it. Wood’s Lamp: This is a device that emits UV light and is one of the most preferred methods of diagnosing hyperpigmentation. The procedure is performed in a dark room. This helps in the determination of the type and extent of the pigmentation. After a few sessions, you will start to notice that the pigments have started to fade away and the natural colouring of your skin is starting to return. In addition, the treatment can reduce the spread of the pigmentation. The treatment will also include treating the root cause of the condition, which will deter further appearance of the pigment. 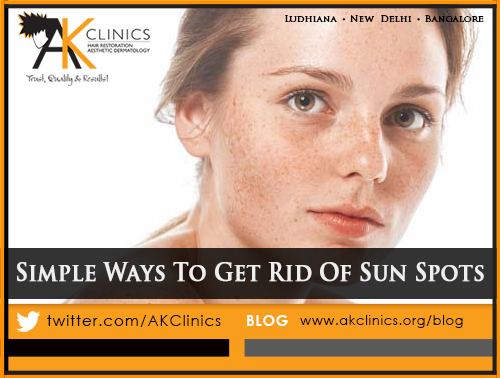 UV exposure – Studies have shown that over exposure to sunlight can lead to pigmentation. Excessive usage of tanning beds can also lead to the condition as can, not using enough sunscreen. Current and past medical conditions – There are several medical conditions that can contribute to the hyperpigmentation, including thyroid imbalance, Cushing’s disease, Addison’s disease, pregnancy, use of birth control pills or even hormone replacement. The doctor will also need to know about the medications that you might have taken in the past few months, because certain medications can also cause the condition. Dermatological or surgical treatments – If you have had any surgeries or dermatological procedures in the past, it would be wise to tell your doctor about the same. A laser will be used and the intense light from it will be passed through the epidermis. The light will be absorbed into the skin pigments. The energy that is emitted will break up the pigment cells and the particles hence created will be removed by the immune system of the body. Almost immediately after the pulse of laser light has been applied, the skin will start to look grey. There could also be a little bleeding. This is part of removing pigmentation treatment. A sign of the top layer of skin turning would be the blistering and crusting. The time taken for the crust to fall off will depend on how deep the pigments are and also where on the body they are. The pigments might not fade after the first session and a few more might be required. Chances are that you will not be done in one session and you will be asked to come back a fair few times. However, immediately after the first session, your skin will feel tender and there could be some superficial bleeding. You will be given instructions on how to care for your skin and you might also be given certain medicines to help with the same. You might be asked not to step out into the sun for a few days or protect the treated area, if you do need to step out. Absolutely; although it is important that all parties involved wear protective eye gear, because the bright light could hurt the eyes. In most cases, after 2-3 sessions, the effects start to become obvious and the effects are long lasting. In most cases, insurance companies will ask for an explanation for the medical requirement of the procedure. If the condition is severe, most companies will offer compensation. As the treatment is done using lasers only, there will be next to no pain, however, there could be little discomfort, but this is not long lasting. However, if you are undergoing a chemical peel, there could be discomfort, itching or irritation, but all these will be temporary. Can Chemical Peels Be Used To Treat Pigmentation? Of late, chemical peels are being used for pigmentation, but these will work best, only if the pigmentation is on the epidermal level. If the pigmentation has entered the dermis, then chemical peels might not be the ideal solution, especially in pigmented skin. However, this is something that only a dermatologist will be able to decide.